At a time when the bars are closed, it's an advantage for all those who prefer to get liquor delivered at their doorsteps. 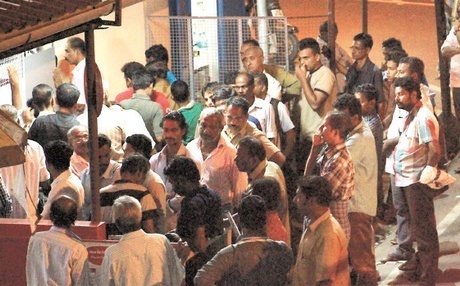 They can avoid standing for hours in the serpentine queues in front of Kerala State Beverages Corporation's outlets as the illegal home delivery of Indian Made Foreign Liquor (IMFL) is booming in the city, and those running this business are making a killing. What is a blessing for these enterprising bootleggers is that the bars are closed and there is less availability of liquor with the shutting down of Bevco outlets as per government policy. And what is more, the illegal liquor which is home-delivered costs even up to three times the one sold by the liquor outlets. The business gets brisker on every first day of the month and during holidays when the Beverages Corporation's outlets remain closed. City Police have intensified efforts to pick up the bootleggers and arrested a person the other day. Excise Assistant Commissioner A S Renjith agreed that the illegal sales goes up during the dry days. “The Excise Department is also taking action against the illegal sales,” he said. On February 1, the Shadow Police arrested a person who is involved in illegal liquor sales. Stephen Raj, 45, of Thiruchendur, Tamil Nadu, a room boy at a tourist home in Woodlands Junction, was the man arrested. According to police officers, college students in the city were his customers. He directed those who contacted him over phone to reach Woodlands Junction and handed over the liquor there. He used to sell the liquor at three times the real price. Three bottles were recovered by the officers from him. The accused has been booked under Section 15 (1) of Abkari Act. Anyone who sells or stores liquor or any other intoxicating drug for sales faces imprisonment of up to ten years and fine which shall not be less than Rs 1 lakh, under Section 15 and 55 (I) of Abkari Act. On February 1, the Shadow Police arrested a person who is involved in illegal liquor sales.